Nine years after the first OM-2, the last model in the series, OM-2 SP was launched in 1984. On this model, programmed AE mode, and manual exposure mode with spot metering was employed, and the light-detect aperture-control system was newly developed and incorporated to make it possible for previously released Zuiko lenses to be used in programmed AE mode. Although the camera had both manual exposure and programmed AE mode, basic controls were almost same to the others in the series. 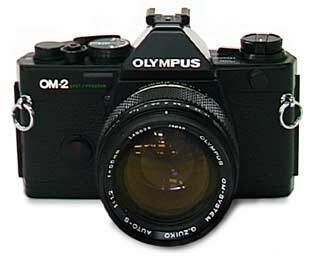 In addition, the OM-2 SP was available only in black. Fisrt introduced in October, 1984. Shutter Speeds : B, 1 to 1/1000 sec. Viewfinder : Fixed pentaprism finder / LED exposure indicator provided. Built-in Self Timer : electornically controlled self timer / 12 sec. for timer. Body weight : 460 g.